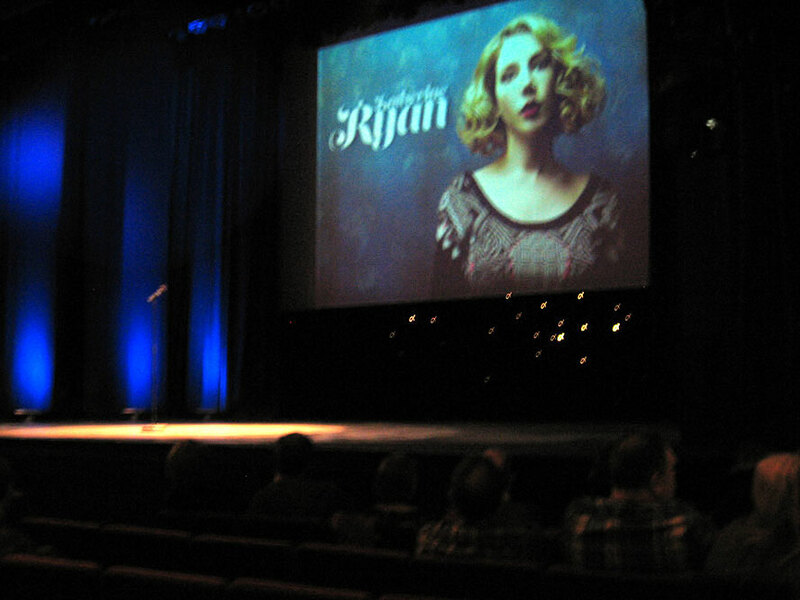 It isn’t very often that a name comedian visits our tiny, end-of-the-line town, so God bless “TV’s Katherine Ryan” for gracing us with her dazzling presence, along with up-and-coming support act Harriet Kemsley. Our volunteer-run pavilion theatre was jam-packed for the event, and it was comforting to be surrounded by so many appreciative comedy fans of all ages (and genders). After a brief interval, and without any introduction whatsoever, Ryan strode onto the stage wearing a pair of killer stilettos, gorgeous black ensemble, large sparkly necklace, and full make-up… which easily assured her status as the most glamorous woman I’ve ever set eyes on in this town. I tried to take some snaps of both comics with my new (used) digital camera, but haven’t quite figured out how to use it properly yet, so they all came out very shaky/blurry. 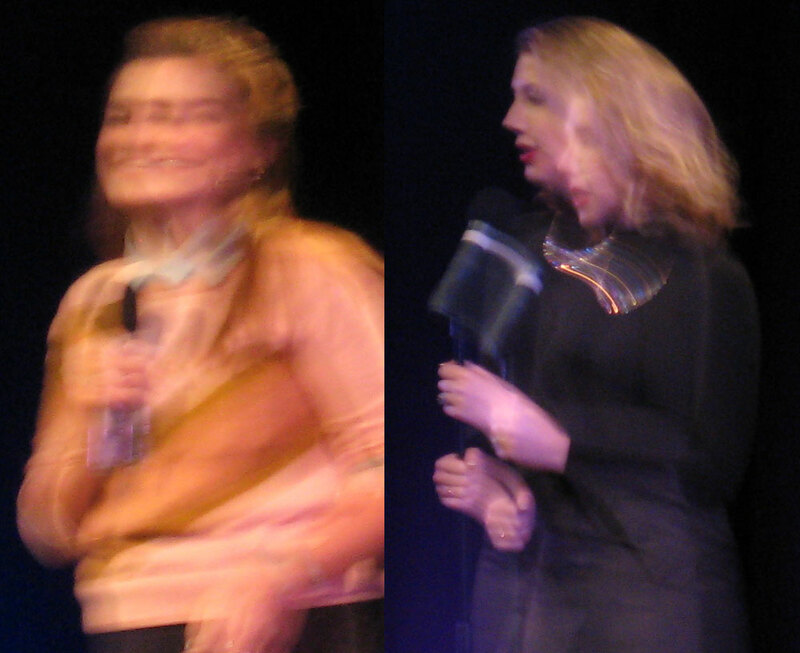 In fact, I spent so long trying to get a decent shot of Ryan that an usher tapped me on the shoulder and told me to put my camera away… just moments before the lady herself declared that she didn’t care about the theatre’s rules, and that she was happy for people to text and take photos throughout her set! Still, I didn’t want to spend the whole night mucking around with my camera, so I should be grateful for the reminder to focus on the live human being on-stage in front of me, rather than the fuzzy version on my LCD screen! I don’t want to spoil (or misquote) all of Ryan’s jokes, but suffice to say that her Kathbum show is an accomplished, crowd-pleasing combination of vicious celebrity satire and endearing anecdotes about her miserable Canadian childhood and proud single-motherhood, littered with strong swears, clever call-backs, and cute puns (my fave being when she noted that her hometown of Sarnia “sounded like Narnia, but with more sandwiches”!). 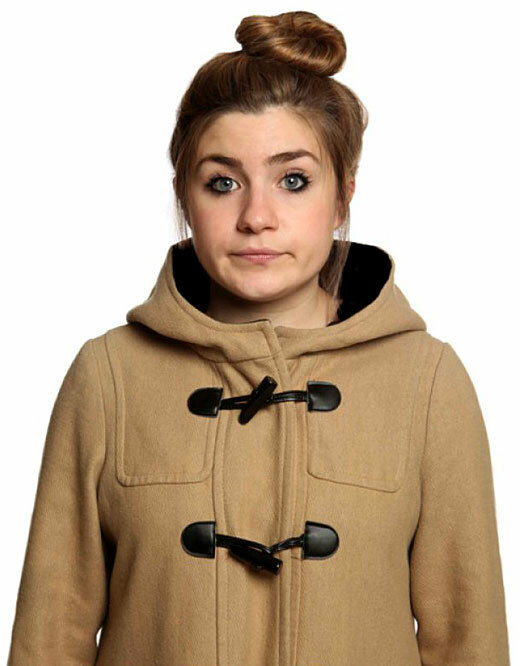 I’ll admit that before last night I only really knew Ryan from her (very funny) appearances on comedy panel shows, but this was such a sophisticated and skilfully delivered show, she’s leapt way up in my estimations and is now my No. 1 fave British stand-up. She absolutely owned the stage, and had the audience roaring with laughter… or cringing and awww-ing where appropriate. I know this sounds like a cliché metaphor, but when I went to bed last night my sides were still literally aching from laughing so hard! This entry was posted in Rants about Stand-Up and tagged Harriet Kemsley, Kathbum, Katherine Ryan. Bookmark the permalink.